New ClaimMaster release 2018.9.0 is here! It has numerous improvements, including many new features and bug fixes – we’ve improved all aspects of the tool, including user interface, claims/specification proofreading, time-saving tools, and various downloading features, as explained in more detail below. You now can quickly generate draft flowcharts directly from the method claims, either in Visio or PowerPoint format. Individual method steps will be converted to flowchart boxes and numbered according to your selected numbering scheme. You also can control the overall flowchart layout and style, such as width and location of step numerals. The new version reworks the interface for checking support of claim terms/words in the specification. You can check for support of both claim terms and individual words, and, if support exists, identify where they appear in the specification. Email shells for client reporting – ClaimMaster now lets you generate reporting emails (Outlook) with attachments for client reporting based on pre-defined templates. Attachments can include Office Action, cited references, claims, claim trees, and other useful information. Shell creation wizard – it is now very easy to convert your existing Office Action responses to shell templates. Simply run them through ClaimMaster shell wizard, insert replacement fields into the new shells, and you are all done. Many new replacement fields – we’ve added dozens replacement fields to customize shell generation process. These fields allow you to embed various useful documents in the shells, and also provide better customization of summarized rejections, dates, and other information in the shells. 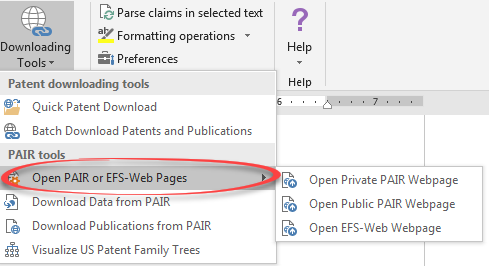 Persistent state – OA Analysis and Shell Generation tools now retain currently loaded information even after being closed. This allows a user to go back and download references/make changes to the currently loaded Office Action without having to reload it again. ClaimMaster now provides you with “as-you-type” suggestions for the commonly used terms in your documents. If this feature is enabled, suggestions will appear after four characters are typed into the document. You can then press “Enter” to bring up a menu that lets you select from a list of suggestions for auto-completing your term name when you type. Or you can use this feature to create auto-complete entries for acronyms, legal statutes, and case cites. You can import terms and acronym definitions into your auto-complete text list from claims and specification, or specify it manually. ClaimMaster now lets you verify the bibliographic data listed in your document against PAIR stored in data. This lets you avoid inadvertently listing wrong application number or other information in your Office Action correspondence, which could lead to misfiling by the USPTO and abandonment. When you use this tool, ClaimMaster will retrieve data for a specified application number from PAIR and compare it to the text of your document. Bibliographic items not found in the document will be highlighted in red, items partially matching text in the document will be highlighted in yellow, full matches will be shown in green. ClaimMaster can now scan your document for mistyped words that are spelled correctly and therefore would not be picked up by an ordinary spell checker. 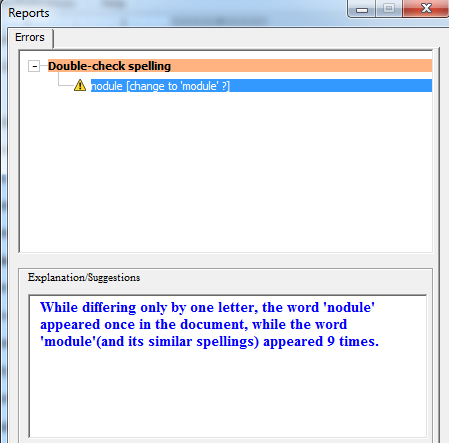 ClaimMaster will identify all instances of words that: (1) appear infrequently in the document and (2) are only a one letter off from a similar word appearing much more frequently. 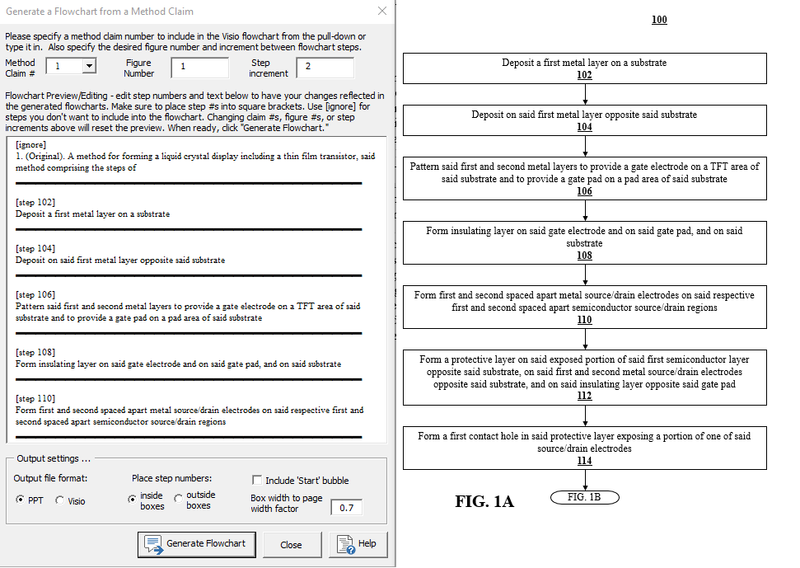 For example, if you refer to the “control module” throughout the patent application, but in one sentence you type “control nodule.” The word “nodule” would not be caught by a spell checker and it could confuse the meaning of the sentence, but ClaimMaster will flag this and other out-of-ordinary spellings as possible issues. ClaimMaster allows you to quickly login to Private or Public Patent Application Information Retrieval (PAIR) and EFS-Web systems. If you store your Private PAIR login credentials, ClaimMaster will automatically log you into the selected USPTO’s system (other than Public PAIR). We’ve improved highlighting functionality for all proofreading features. 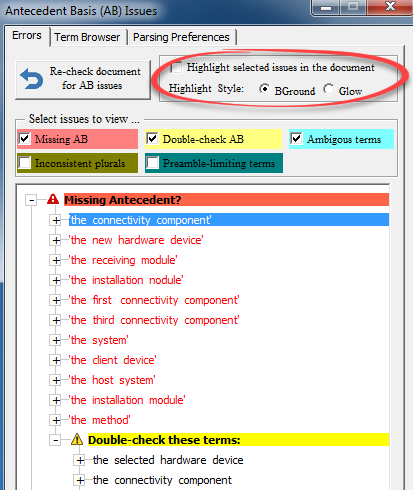 You now can highlight currently identified errors in each proofreading view directly in your document using either background highlighting or font glow formats (Office 2010 or later).